If you’re looking for deck inspiration, you’ve found it. Whether your design tendencies are purist or avant-garde, whether you lean toward classic redwood or an ecologically-minded cellular PVC, and whether you’re seeking a cozy outdoor living space nestled into your home or a sweeping, multi-level grand expanse, Chris Peterson’s Deck Ideas You Can Use, Updated Edition highlights the beauty, function, and design of all makes and models of decks. So pull up a chair (a deck chair! ), and dive right in to this stunning handful of images from a truly inspiring book. Create multiple outdoor “rooms” with a multilevel deck. Although a multilevel design requires more planning, expertise, and expense, it also makes the deck exponentially more usable and is especially ideal for a sloping yard. Define different areas by the features you place there, positioned according to what makes sense. This deck’s upper level has been divided into dining and casual seating areas, close to the kitchen. The hot tub has been positioned on a lower level, where its weight is more easily supported, and the tub is accessible from the pool. Expand a porch with a deck of the same material. These homeowners replaced the existing porch decking with the decking they used in constructing a two-sided expansion. The result is a seamless structure that looks entirely natural. White posts and top rails in the deck railings match the porch roof posts and the color of the home’s siding, reinforcing the integrated nature of the design. Use a poolside deck as a fantastic opportunity to go beyond the staid traditional stone patio surface. The deck around this pool spells luxury with a capital L, including two built-in pergolas that define and separate sitting and dining areas. The rest of the deck is left uncovered to allow for unrestricted sunbathing, and to exploit an incredible wooded vista on the other side. Use a deck to turn a beautiful view into a usable sanctuary. This bi-level lower deck transformed a large, densely forested, hilly backyard into a secluded outdoor hideaway perfect for recharging your batteries and entertaining well away from the pressures of the outside world. Subtle but effective wired-in lighting makes the space enjoyable night or day, and complementary browns in the border boards, level transition, and field of the deck provide a measure of visual interest while blending into the surroundings. Introduce fabrics to bring luxury to your deck. A rather plain view is dressed up with the many textures scattered around this simple backyard deck. Glass partition railings add a sleek element, and removable overhang features canvas drapes that can be closed to create an intimate space when necessary. Upholstered cushions provide invitingly soft surfaces that promote lounging and socializing. The look is also incredibly upscale. Say “magnificent” in your deck design by leveraging the glory of redwood. High-end, upscale deck installations are perfect places to show redwood decking to its best advantage. The natural elegance of the wood’s surface is the ideal complement to stately features like the thick railing and impressive lantern posts on the bridge of this deck. Make the most of redwood’s natural allure by nestling a deck in a woodsy setting. Nowhere is a redwood deck more at home than under a copse of trees on an untamed woodsy hillside. This deck provides wonderful outdoor space on a previously unusable slope, and seems to meld into the earth tones surrounding it. The underlying support structure was built of less attractive and less expensive pressure-treated lumber. Redwood fascia boards and lattice skirting ensure the alluring color and patterns of the redwood dominate. Redwood is regional. The cost and availability of redwood varies according to your locale. It is plentiful and relatively affordable on the West Coast and in the Pacific Northwest. Grace a deck with the magical, honey-amber shades of garapa. Also known as Brazilian ash, clear heart garapa is the most common quality garapa used, ensuring that there are no knots or imperfections to mar the enchanting surface color. This deck has been finished in a clear, penetrating, oil-based sealer that maintains the original color. Notice the builder used steel post-and-beam supports that are visually unobtrusive and tie the deck and pergola to the modern architecture of the house. Contrast the intriguing chocolate brown of ipe hardwood decking with crisp white. The introduction of bright white helps accentuate the fine grain and lush color of the hardwood. The railings and fascia boards are made from composite materials; using less expensive materials for details like these goes a long way toward cutting the overall cost of a hardwood deck. Mix board direction and grain pattern to ignite visual dynamite. The undulating pattern of the tigerwood in this deck not only grabs attention, it is also a low-maintenance option that costs less than many other hardwoods. The wood features an absolutely riveting deep golden-brown base color with darker brown or black striping throughout. This deck makes great use of the wood’s patterns, with boards running toward a diamond inlay centerpiece. Create this sort of visual interest and you may find guests on the deck spending more time looking down than checking out the view. Choose from a vast range of colors, textures, and grain patterns. Many composite products mimic expensive hardwoods, such as this deck that looks convincingly like a tropical ironwood, such as garapa. Even with modest fading, this deck will look like a much more expensive wood structure for decades to come, all with the minimal maintenance of two to three cleanings per year. Fight moisture with the right composite. Different composite materials are formulated to have different strengths and weaknesses. This particular product boasts incredible moisture resistance, making it ideal for situations where water is a near constant—such as the lakefront and rainy forest setting of this extended deck. Buying the right composite for your situation is the way to get the most out of your decking dollar. Look beyond obvious spaces for deck opportunities. This entryway is well-served by a tiny deck that is part of a sophisticated entrance design. The curved shape is inviting and space-efficient, directing visitors up the stairs, over the rock moat, and right to the front door. The dark hue of the ipe hardwood decking reinforces the visual sense of a small, intimate landing space in front of the door. Add curves to bring excitement to a medium-size deck. This deck would have been fairly uninteresting as a rectangle, but a chic curving front creates the contour of a grand piano. The shape blends the edge of the deck nicely with the yard’s profuse flowering shrubs. The inlaid compass star completes a deck design that, while simple, is incredibly stylish. Create a very pleasing look by using symmetry to provide visual balance. This attractive deck includes matching border benches on either side that not only offer abundant seating, they also help focus the eye and lead the visitor to the stone path running out into the backyard. The homeowner has carried through the idea of symmetry with planters on either side the sliding glass doors. Integrate a deck by elevating it. Although this deck could have been built in levels stepped down the slope behind the house, the feeling is much more bucolic and ethereal by projecting the surface into the trees. The feeling of is one of seclusion, privacy and calm. The perfect atmosphere to enjoy a soak in a spa tub . . . while enjoying a few seasonal decorations! This photo-rich book is the tool every DIYer and homeowner needs to plan and design a beautiful custom deck. If you’re looking to build a new deck or remodel the one you have, you want to start by spreading some innovative deck designs in front of you. Look no further than Deck Ideas You Can Use, Updated Edition. 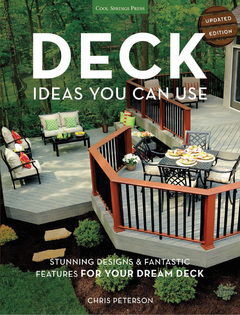 The updated and expanded edition of this book is the deck design tool you’ve been searching for–packed with useful information and full-color photos to help you determine the deck of your dreams. From choosing deck building materials to settling on railings to adding a splash of color with flower-packed planters to complementing the architecture of your house, this book covers every aspect of the design process to help you create a custom deck that’s perfect for your home and yard. Ask yourself if you want traditional or curved stairs. Do you want to give the deck surface some character by adding an inlay? You might include built-in benches. What’s the overall purpose of the deck? Will you be outside grilling or simply relaxing with a book? You’ll answer all of these questions as you page through Deck Ideas You Can Use, Updated Edition. Written and researched by noted DIY author and designer Chris Peterson, this updated and expanded edition of Deck Ideas You Can Use features 32 new pages, more than 100 all-new photos, plus all-new text on popular deck design topics such as new, state-of-the-art building materials, LED and solar lighting, accessorizing and decorating, and accessibility. This editorially driven new book is truly packed with design and building information you can, and will, use. Chris Peterson is the author of numerous books on home improvement, including Deck Ideas You Can Use and Bathroom Ideas You Can Use, both published by Cool Springs Press.